Brighton Natural Solutions is a natural health clinic offering alternative therapies for women’s health problems. The business was founded by one woman who studied a range of holistic therapies in Australia and Japan. She is a specialist in naturopathy, which is the most comprehensive natural health-care system in the holistic field. The company approached East Sussex Web Design because they were not getting enough hits on their website and felt that they needed an SEO strategy targeting their specialist field of naturopathy. 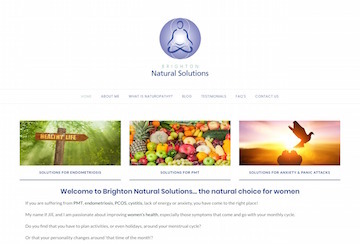 We focused our SEO strategy on “naturopath brighton” to get them to No. 1 in Google for that search phrase and now have extended their online marketing to cover complementary therapies for women’s health in Brighton and Sussex. Website Design that looks great on all screen sizes. Boost your website rankings with SEO and watch your online business grow.